Welcome to Week Commencing 12th June 2017! Three week long deals at 20% off now on the Alternative Armies website for Flintloque, High Fantasy and 15mm scale. So the deal is just on those 3 packs, correct, and not all of each line? Little confusing. Correct. The three codes listed have the offer on all options for them on their page. I fail to see the confusion. Can you tell me how you thought it applied to the whole of each of those three lines please. It would assist me in refining the language used and no one thus far has asked us to define it further. 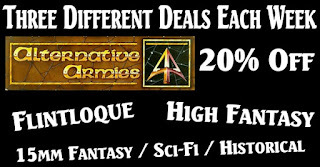 Three week long deals at 20% off now on the Alternative Armies website for Flintloque, High Fantasy and 15mm scale. Three week long deals at 20% off now on the Alternative Armies website for the following items from the Flintloque, High Fantasy and 15mm scale lines. I do TechSupport for my company's products and have to explain what our catalog is trying to say all the time (I'm in engineering). You know what you want to communicate, but your bias for your own writing can throw you off some times. At least it does for me too, sometimes. Goragrad's example is probably the best we're going to see. If you just look at the image it reads that the 3 deals are 20% off Flintlouqe, High Fantasy, and 15mm Fantasy/ Sci-Fi/Historical. In your description you could say. "The following are this months deals:" and then list the three packs. The image used implies 20% off the lines listed. As a casual observer i would expect a "limited codes" or * denoting limitations. Thanks chaps. Very interesting. The new system has been running for near two months now and this is the first time it has been taken upon to make changes to the wording. I shall endeavour to do better. The miniatures in the ISARUS range are from Alternative Armies and also formally of Table Top Miniatures and others. should read – The miniatures in the ISARUS range are from Alternative Armies and also formerly of Table Top Miniatures and others. That seems to have come over from the old website. P.S. One of these days when you have a more general sale on I'll be ordering Medus and Iaurus lines. Possibly some of the Tabletop and HOTT fantasy as well. Such is life. The running of the websites is a large ongoing task. I shall go along and alter that today, thanks Goragrad.